Do you like cute little monkeys? Or perhaps candies? THIS GAME PROVIDES YOU BOTH!!! Help the little monkey get the candies it wants. It has a whole box of sweets but unfortunately, the box is closed. So YOU must make the monkey happy. Shake out all the candies from the box to feed your adorable pet. Its delight and full tummy will be an adequate reward for your effort in getting out the candies. Just make sure you don’t get too tired – there will be no candies if you lose your strength. 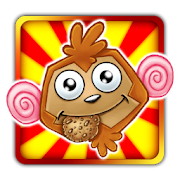 Use your dexterity, tilt and manoeuvre the box so that the candies fall out through the holes right to the hands of your little monkey friend. Avoid obstacles and watch out for the power strip. Apart from that the box may also contain undesired objects like chilli paprika or a battery – be careful to leave them inside the box. You don’t want the monkey to get sick or affected by an electrical shock.